It seems that the days of someone building a site from scratch without the help of a CMS are long gone. There are simply too many on the market that can cater for every user, every style of site and every level of tech related knowledge. Whatever your level, whatever your intended use, you can find a CMS to suit you. Not to mention the time/costs in getting something custom built, to be honest it makes little sense in reinventing the wheel when the applications that are out there are more than adequate. In this article we’ll run through some of the more common content management platforms and some of the not so common ones if you’re feeling a bit adventurous. I know I said that this article is more than just WordPress but it’s so popular these days, so widely used and so feature-rich that it simply has to get a mention. What started out as a basic, run of the mill blogging platform has transformed to one of the most advanced content management systems on the planet. Whether you want to setup and operate a basic blog, a 1,000,000 hit a day content site or even a complex online shop – WordPress can do it all. And even if WordPress can’t do it out of the box you can rest assured that there will be some add on/plugin for it that can cater to your every need. If you’re an experienced developer you might be surprised to see this one in the list but it is most definitely one of my favourites. It’s lightweight and doesn’t even need a database which is a big, big plus in my opinion. Grav uses flat files and the Markdown language/formatting as a content processor which makes it not only extremely fast loading but also extremely easy to lay things out without complex, memory intensive WYSIWYG editors. Admittedly, it takes a bit of leg work to get things going but there is help at hand should you want to do a full install. Or just get your web host to do it for you. Even if you don’t end up being a long time user of this app at least give it a try and see what you think. In terms of a full, all round content management system there isn’t much better than Joomla. It has always been a content management system for “websites” and not just blogs like WordPress and as a result of that the style of sites you can create with this application have a lot more scope than being locked in to something like WordPress. Whilst some of the admin panel shows its age it is still a major player and add ons and modules are forever in development. 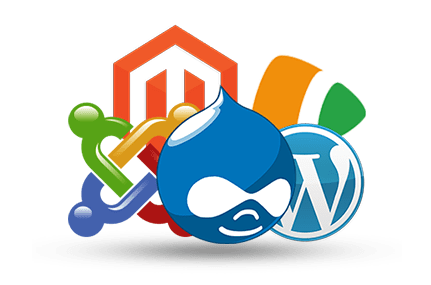 Drupal is favored amongst developers as it’s not considered as noddy as the likes of WordPress and Joomla and you can do a hell of a lot more with it in terms of customisation of your site without needing to rely on third party plugins and advanced theme features. Unfortunately Drupal seems to be losing a bit of the markershare in recent times due to the popularity of WordPress and also people opting to use the new fangled online website builders in order to create their online masterpiece. It’s unfortunate but it’s a sign of the times. So there we have it. Hopefully on your next build you’ll try one of the other apps rather than just going with your tried and tested WordPress. Who knows you might find something you prefer and if not, no harm done, you can always revert back and install WordPress as you see fit. Lots of the above have scripts/plugins available to merge databases or import/export between solutions so even if you’re switching at a later date, it’s not the end of the world.